Japanese Probe Makes 2nd Try to Orbit Venus, But Did It Succeed? Artist’s illustration of Japan's Akatsuki spacecraft at Venus. A Japanese spacecraft should be orbiting Venus now, if all went according to plan Sunday (Dec. 6). The Japan Aerospace Exploration Agency's Akatsuki probe fired its small attitude-control thrusters for 20 minutes Sunday evening in a second and final attempt to enter Venus orbit. Akatsuki's first try — which came exactly five years earlier, on Dec. 6, 2010 — failed when the probe's main engine conked out during the orbit-insertion burn, sending the spacecraft sailing off into deep space. It's too early to know if Akatsuki is indeed safely circling the second planet from the sun, the spacecraft's handlers said. 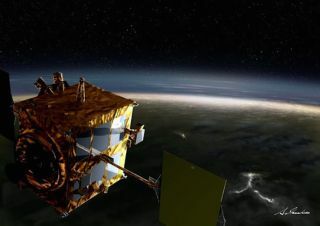 "The orbiter is now in good health," Japan Aerospace Exploration Agency (JAXA) officials wrote in a mission update Sunday. "We are currently measuring and calculating its orbit after the operation. It will take a few days to estimate the orbit; thus we will announce the operation result once it is determined." Akatsuki's orbit will be much more elliptical than originally planned — featuring a period of 8 or 9 days, compared to 30 hours for a 2010 Venus arrival — if Sunday's maneuver worked. But the probe should still be able to achieve most of its mission goals, JAXA officials have said. Akatsuki performed the engine burn Sunday at 6:51 p.m. EST (2351 GMT; 8:51 a.m. on Dec. 7 Japan Standard Time), according to the JAXA update.